US, 2003, 100 minutes, Colour. Paul Giammati, Hope Davis, Judah Friedlander, James Urbaniak, Harvey Pekar, Joyce Brabner. Harvey Pekar, a Detroit-based hospital filing clerk, discovered early in life that he was not meant to be a superhero. In fact, his life was more than particularly ordinary. Rather grumpy, no clothes-horse, paunchy, with two failed marriages, he got along by selling records and collecting comics. When he met cartoonist, Robert Crumb (the subject of Terry Zwigoff's fine documentary, Crumb), some of his life changed for the better. He started to write captions about his daily life, his humdrum experiences. Crumb liked them and offered to draw them. 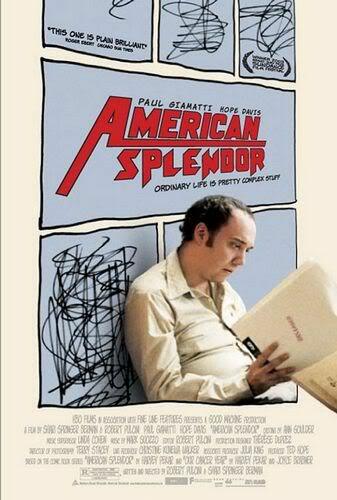 The result was the American Splendor comics. Pekar continued in his day job until 2001. However, his comics took off and, for a time, he was an acerbic guest on the Letterman show. He married an admirer, Joyce Brabner, who also created a book on her charity concern visits to Israel. Harvey developed a cancer but overcame it - but the experience resulted in a joint effort by Harvey and Joyce, a comic book on his cancer year. Joyce, an intuitive diagnoser of other people's mental problems, wanted children. Harvey did not. Yet, when a cartoonist friend left his daughter in the care of Harvey and Joyce, they found fulfilment and adopted her. This film is basically a docudrama. However, it is full of zest, humour, pathos, with an original style. We see the real Harvey and the real Joyce. Interviews with them are interspersed throughout the film, sometimes with the actors playing them watching the interviews. Most of the Letterman shows are actual - except for the last one where Harvey tells him off. Paul Giamatti is wonderful at recreating Harvey, an impressive performance and impersonation. Hope Davis is excellent as Joyce. This is an affectionate but strong critique of American life and a creative way in cinema of doing what cartoons and captions have done in Harvey's comics and books. 1. The acclaim for the film? Its Grand Jury prize at the Sundance Festival? Harvey Pekar and his life, an ordinary life, a life with comics, television, cancer? Life in Cleveland? The authenticity? The real Harvey appearing and Joyce Brabner's participation? 2. The title, Harvey Pekar's comics, its irony? The contrast with Superman and other heroes? The ideas for the comic strip, real-lie experience in ordinariness, others doing the drawings? The ironies of the comics? 3. The structure and its style: the directors and writers as interviewers, a documentary with the real Harvey and the real Joyce? The authenticity of their presence? Harvey's voice-over, ironic comments? His appearances, body language, revelation of character? His comments on the film, on the fee, on the actor playing him_? Hope Davis as Joyce and the real Joyce appearing? The actual sequences from the David Letterman show plus the sequence which was acted? Sequences with Paul Jamati watching the real Harvey Pekar being interviewed? The ending with all the real characters present? 4. The prologue, 1950, Halloween, the children dressed as Superman and other heroes, the woman asking Harvey who he was and explaining his ordinariness? Wandering down the street, the transition to the older Harvey? His slouching appearance, atmosphere of gloom? Slob style, clothes? The loss of his voice and its effect? The emergence of his talent? 5. The film as a portrait of Harvey Pekar, his initial comments about being behind the Jewish woman shopper at the supermarket? Referring to himself as a Yid? The background of his family, their expectations? His working as a filing clerk in the hospital and doing that for decades? The sequences showing him at work? His two failed marriages? His relationship with people, in the street, at the hospital? 6. His friends, his involvement with comics, selling records? The meeting with Robert Krum, their talk, his admiration, their becoming friends, showing his captions to him, Krum doing the drawings? The success of the comic strips? Yet his staying at his work, remaining crotchety? 7. Joyce and her fascination with the comic strips, their being sold out in the shop, her ringing him? Her decision to go? The arrival and the humour of non-recognition? The bond between them, their discussions? His marriages and their effect? His decision to marry Joyce in a short time? Her support, yet her nagging and pushing him? Her own clinical depression? Her propensity for diagnoses of others? 8. The Letterman show, the success of his comics, going on the show, the repartee with Letterman? Joyce in the Green Room and watching, her irritation, the man with the crocodile? The continued performances on the Letterman show? His eventual reacting against it? Joyce and her depression, the possibility of going to Jerusalem, his unwillingness, her decision to go, her staying? The book emerging from this experience and its awards? 9. The dramatised sequences interspersed with the real Harvey? His comment about finding another person with the same name in Cleveland? His reflections on personality and individuality? 10. Joyce's success, its effect on her, the book-signings, her encouragement to do further work? 11. Harvey and the diagnosis of cancer, discovering the lump, telling Joyce, going to the doctor, the diagnoses, the therapy? The suggestion that they do a book - The Cancer Year? Its success and awards? 12. Harvey going on the Letterman show, the clash, his impatience with the jokes and the seeming phoniness? 13. The friend coming in, helping them with the drawings? Bringing his daughter, Joyce and her playing with her, the bond between the two? Diane sharing their life? Joyce wanting to have children and Harvey unwilling? The friend leaving Diane, their adopting her? The humanising of Harvey? His final retirement and the celebration? 14. The success of the film as a documentary, as drama, as an involvement of audiences with a real character and his life experiences and struggles, his artistic expression of these? The film like a comic strip, as ordinary America, a piece of Americana?